QAI now uses NSF Connect to facilitate your organic certification! This new online system makes it easier for you to respond, track and upload documents for your certification. With NSF Connect, you can respond directly to requests for information or provide information to address non-compliances. You can also download certificates and invoices. You can access NSF Connect at any time through the Client Login link at the top of the QAI home page. QAI customers will receive an email from NSF (our parent company) with your login and instructions on how to create a new password for your account. If you have multiple facilities and would like to see the status of all facilities from your dashboard, please adjust your account settings as shown in this tutorial. 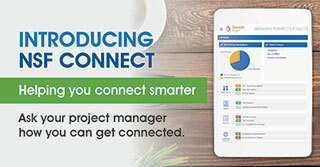 If you have questions about NSF Connect, please contact your project manager.